Educating the whole man means providing opportunities for excellence in athletics as well as academics. Catholic Central achieves that by fielding teams in fourteen interscholastic sports. All of the athletic teams strive for excellence. 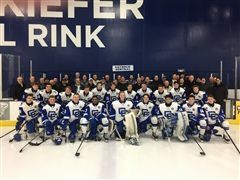 Many programs have Junior Varsity teams to allow additional participation. Many even have Freshman teams to give additional opportunities for development. Some sports have limited team size to insure that every one plays. Others are "no-cut" sports with no limits on participants. Making a gift to Detroit Catholic Central High School electronically is quick, easy and safe. With our secure server, all of the data, including credit card information, is safely submitted to our gift processing department. If you have any questions regarding any of the giving opportunities listed, please contact the Office of Advancement at 248.596.3838. List of 11 news stories. A celebration of thanksgiving for the leadership and legacy of our President - Fr. John Huber, CSB and our Principal - Fr. Dennis Noelke, CSB ’71 will take place on Thursday, May 30, 2019 here at CC. On Tuesday, May 7, Catholic Central will host author W. Todd Kaneko for its Fourth Annual Poetry Night. Each year a different guest poet is asked to read some of their work and answer questions alongside some of CC's best student poets. The event is scheduled to begin at 7:00 PM in the media center and is open to all students, faculty, alumni and friends of the school. Catholic Central is thrilled to share the news of our new Community Partnership with Joe Maiorana ’77 and Joe’s Produce Gourmet Market & Catering! All legacy classes (1929-1969) are invited to campus for the annual 16th AnnualLegacy Reunion on Wednesday, June 12, 2019. The festivities begin with mass in the CC Chapel at 11 am, followed by a complementary luncheon. Our special guests this year will be the Class of 1949 celebrating their 70th Reunion! 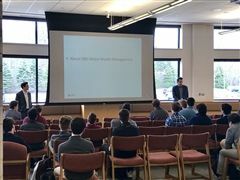 On April 10, 2019 Dr.'s Gavin Ambrosi '06 and Jesse Zrull '06 returned to their alma mater to speak to Sophomores about career paths in medicine. 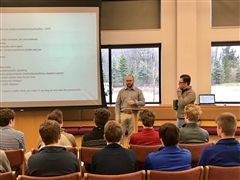 On April 11, 2019, Greg Merrill '08 and Brad Bocketti '13 returned to Catholic Central to speak to the Finance Club. Greg and Brad are Financial Advisors for UBS Private Wealth Management. The CC Finance Club is a group of students focused on learning the in's and out's of wealth management. They manage a portfolio of donated dollars focused on longterm growth to benefit the school. The group is led by teachers Kevin Griffin '96 and Anthony Cornish. On April 5-6, Mr. Dan Collins ‘84 led our Campus Crusade down to Ohio to the campuses of Miami University and the University of Dayton. 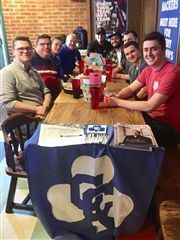 On Friday night, he met up with seven former and one current Shamrock at Mac & Joe’s in downtown Oxford, Ohio. On Saturday afternoon, nine former Shamrocks met at Milano’s in Dayton, Ohio. Stay tuned for a recap of our 2018-2019 Campus Crusade in the coming weeks. Fun times at the Florida Reunion! 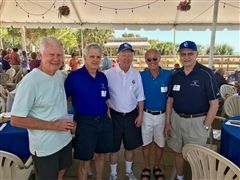 The Annual Florida Reunion, started by members of the Class of ‘55 and originally hosted by Terry ‘55 and Karen Brady, welcomed 100+ Shamrock Alumni and guests to sunny and beautiful Venice, Florida on Saturday, March 30, 2019. The past several years, Mike ‘71 and Donna Pachota have hosted this great gathering at their fantastic restaurant, Sharky’s on the Pier, on Venice Beach. The atmosphere, weather, CC Camaraderie, food, and superb family hospitality was second to none! All CC Alumni, family, and friends are welcome. See you in March 2020! 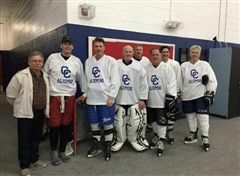 More than 70 CC alumni will take the ice in the annual alumni hockey games! “Teach Me Goodness, Discipline, and Knowledge” is the motto of the Basilian Fathers and the sacred mission of Catholic Central High School. 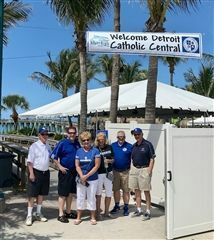 For ninety years, the graduates of Catholic Central have made a positive impact locally, nationally, and around the world.